A functional food is any food claimed to have a health-promoting or disease-preventing property beyond the basic function of supplying nutrients. Nutritional interventions using functional foods have had a considerable role as legitimate therapeutic strategies to combat common metabolic disorders in Canada and around the world. Acceptability of functional foods is a constantly evolving challenge to nutritional interventions where compliance is a key factor for success. Incorporation of novel ingredients in functional foods may shift the molecular balance of flavour precursors which can compromise consumer acceptability. Therefore, understanding the molecular interactions among natural flavor precursors and added bioactive compounds is crucial to our understanding of flavour formation in functional foods. Once ingested, the bioactive compounds are susceptible to major changes in the body with formation of novel compounds engaged in different biochemical pathways. The metabolomics studies of the metabolites derived from functional foods in the body are extremely informative on the effects exerted by these compounds. The focus of Dr. Aliani’s research is therefore twofold. To investigate the effect of active compounds on metabolic pathways in animal and human model. Michel Aliani is a Professor at the Department of Human Nutritional Sciences at the University of Manitoba and a member of the Canadian Centre for Agri-Food Research in Health and Medicine in Winnipeg, Manitoba. He was educated in France (B.Sc. and Engineering degree in Agri-Food Biochemistry) and in Northern Ireland (PhD, and Post-doctoral at Queen’s University Belfast) prior to move to University of Manitoba in 2007. His area of scientific expertise includes food science, mass spectrometry and metabolomics. Michel Aliani and Michael N. A. Eskin provide a thorough review of bitterness that includes an understanding of the genetics of bitterness perception and the molecular basis for individual differences in bitterness perception. This is followed by a detailed review of the chemical structure of bitter compounds in foods where bitterness may be considered to be a positive or negative attribute. To better understand bitterness in foods, separation and analytical techniques used to identify and characterize bitter compounds are also covered. Food processing can itself generate compounds that are bitter, such as the Maillard reaction and lipid oxidation related products. Since bitterness is considered a negative attribute in many foods, the methods being used to remove and/mask it are also thoroughly discussed. 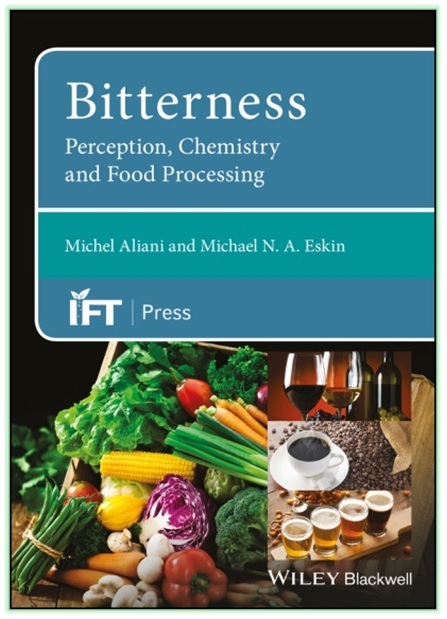 For $199.95 you can own a 264 page hardback copy of Bitterness, Perception, Chemistry and Food Processing. Visit http://www.wiley.com/buy/9781118590294.